Joanna uses round courgettes for this but long ones work just as well. Preheat the oven to 180ºC, gas mark 4. Halve the courgettes lengthwise and scoop out the pulp with a teaspoon. Chop the pulp and set aside. Heat half the oil in a frying pan over a gentle heat. Add the shallots, garlic and courgette pulp. Fry for 10 minutes, stirring, until all the liquid evaporates. Add the dried herbs and season. 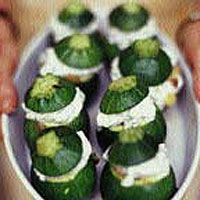 Fill the hollowed-out courgettes with this mixture. Put them in an oven dish. Sprinkle over a glassful of water and a little olive oil. Bake for 40 minutes. Meanwhile, chop the mint and mix with the cheese, cumin and remaining oil. Season. Take the courgettes from the oven, cool for 5 minutes, then fill with the cheese mixture. Serve warm.